This museum has one of Canada's finest collections of both ship models and ship portraits, as well as the world's largest assemblage of wooden artefacts from the Titanic. 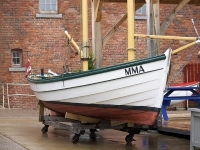 In addition to a collection of about 24,000 marine photographs often dating back to the 19th century, there's also examples of rare and beautiful unique Nova Scotian boatbuilding traditions with its small craft displays. The exhibition includes shipwreck treasures, naval World War II convoys, steamboats, and the opportunity to explore the 1913-built ship CSS Acadia at the dockside. The museum also has a large collection of genealogical resources, including journals, diaries, ship's logs, shipping registers, and a library containing more than 5,000 books relating to shipping.